Each scorecard includes 12-16 key performance indicators, in total 250 key performance indicators for Business Analysis. Download the evaluation version of the scorecard. 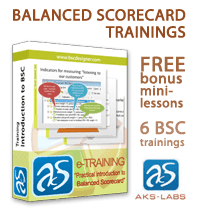 The Business Analysis Method Toolkit includes 16 scorecards. 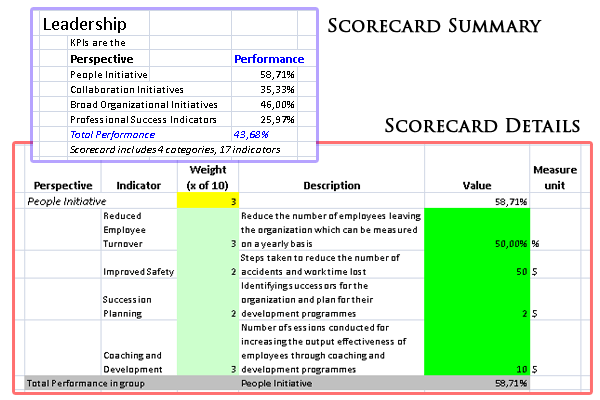 The example below shows how the Leadership Balanced Scorecard looks like in BSC Designer Light. Download the evaluation version of the scorecard. Budgeting and Forecasting [16 key performance indicators]. 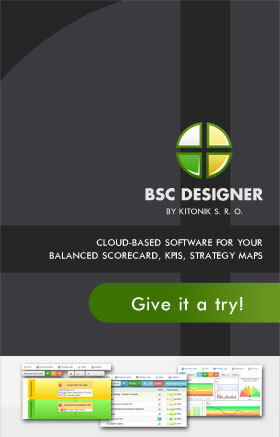 Business Strategy [16 key performance indicators]. Marketing Research [17 key performance indicators]. Business Mission and Vision [17 key performance indicators]. Competitor Analysis [21 key performance indicators]. 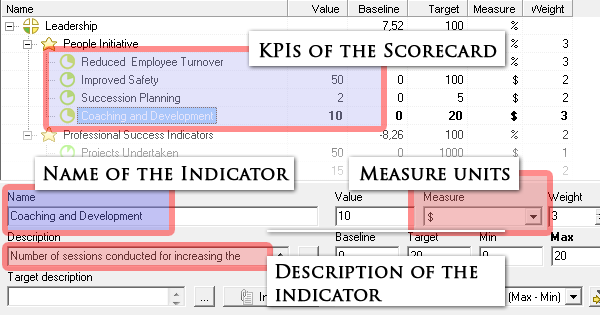 Benchmarking [14 key performance indicators]. Financial Benchmarking Scorecard [18 key performance indicators]. Financial Risks [17 key performance indicators]. Financial Statement Analysis [14 key performance indicators]. Innovations Scorecard [11 key performance indicators]. Leadership Scorecard [17 key performance indicators]. Motivation Scorecard [17 key performance indicators]. 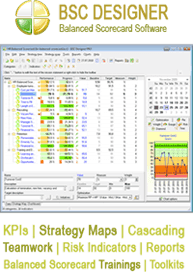 Work Productivity Scorecard [13 key performance indicators]. Market Risk [12 key performance indicators]. Operational Risk [14 key performance indicators]. Risk Metrics [16 key performance indicators].